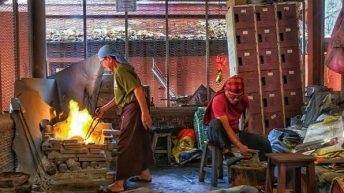 Back in 15thcentury England, this was how a traditional nursery rhyme and fortune-telling game ran. 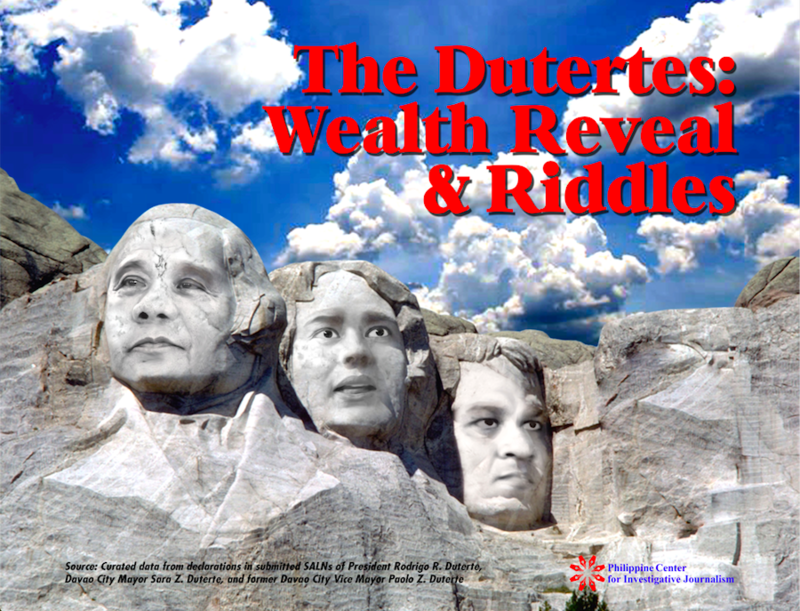 Later in the United States, it became a popular counting song of children playing tag as they called out who would be “it.” In the Philippines today, it could well be the riddle that is the state of wealth of the President’s family. 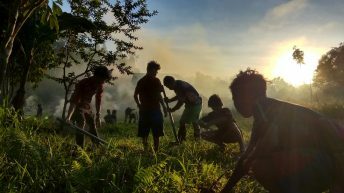 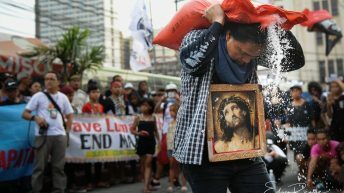 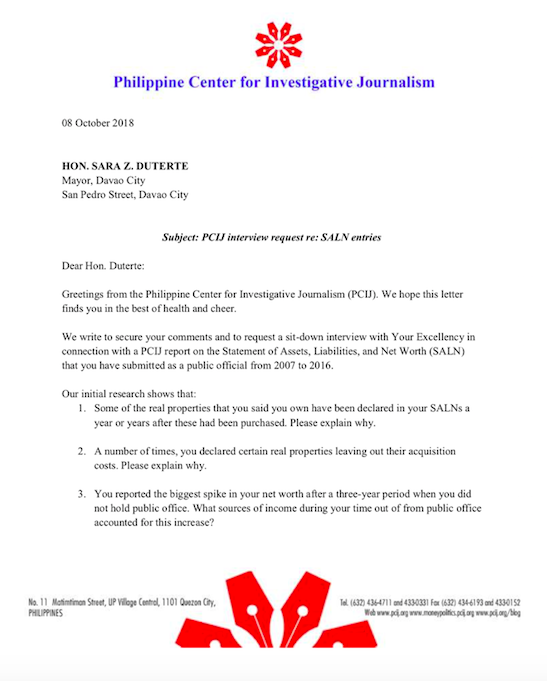 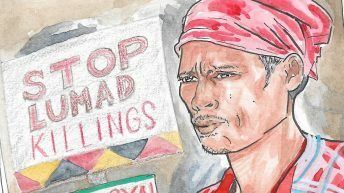 Among the matters that Paolo may have helped clarify had he replied is that involving one of his personal creditors who had secured not just an appointment in 2016 as chairman of the Philippine Judo Federation, but also a certificate to import rice from the Bureau of Plant Industry in March 2017. 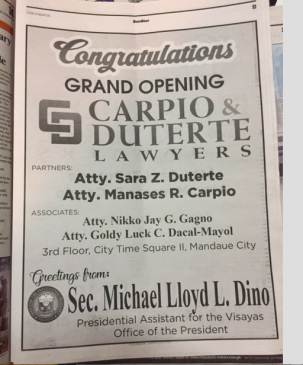 Soon after Ma was appointed Philippine Judo Federation (PJF) chairman in 2016, the businessman offered a part of his 1,000-square-meter building along Ma-a Diversion Road as the new training center for judo and office of the Philippine Sports Commission-Philippine Sports Institute (PSC-PSI). 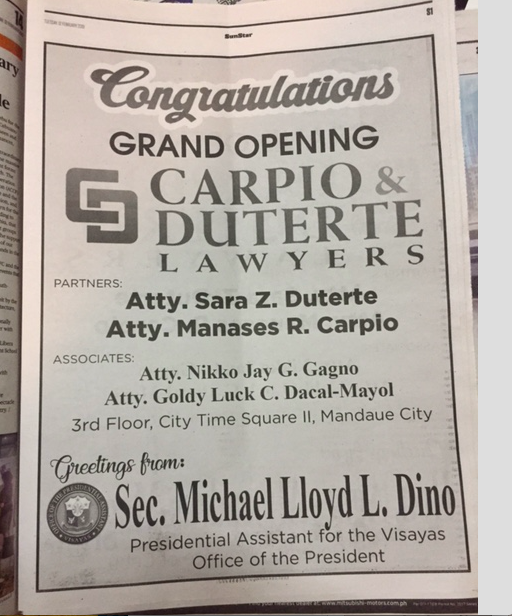 A SunStarreport quoted Ma as saying that the center will accommodate all judokas not just in the city, but also from the entire region, starting 2017. 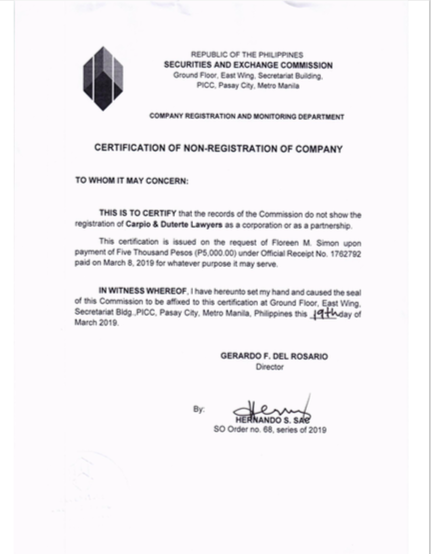 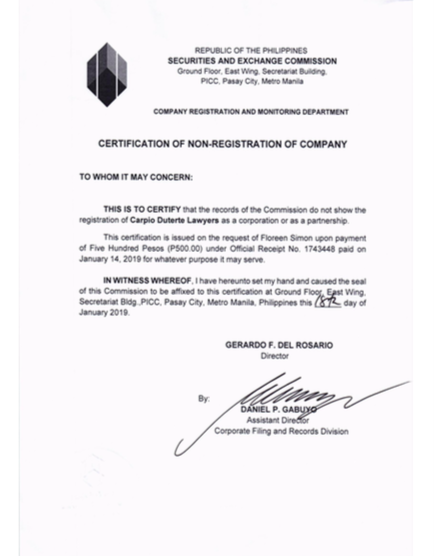 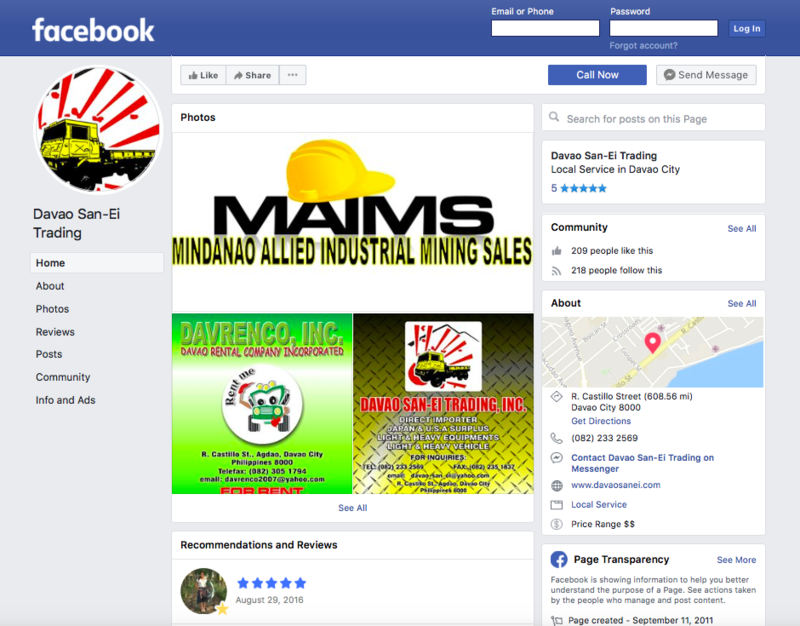 The databases of both the SEC and DTI do not show any registration or other corporate documents for Davao San-Ei Trading Inc. Two other companies where Ma is listed as president and stockholder have records as of 2018 and 2019 with the SEC: Mindanao Allied Industrial Mining Sales (MAIMS) and Davao Rental Co. Inc.(Davrenco). 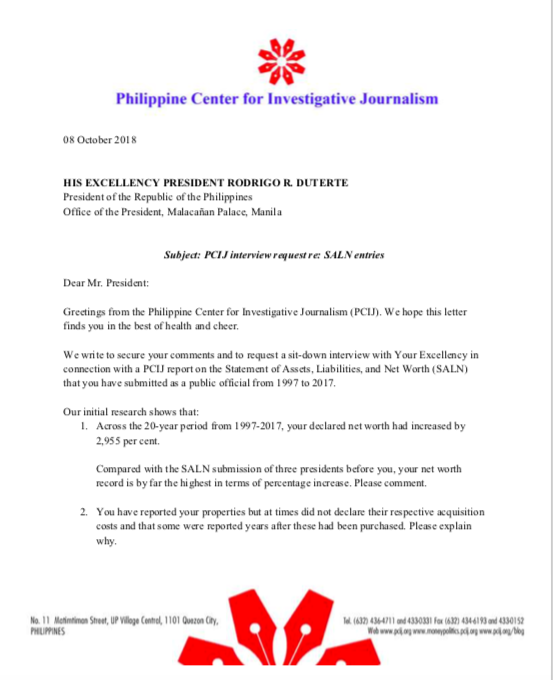 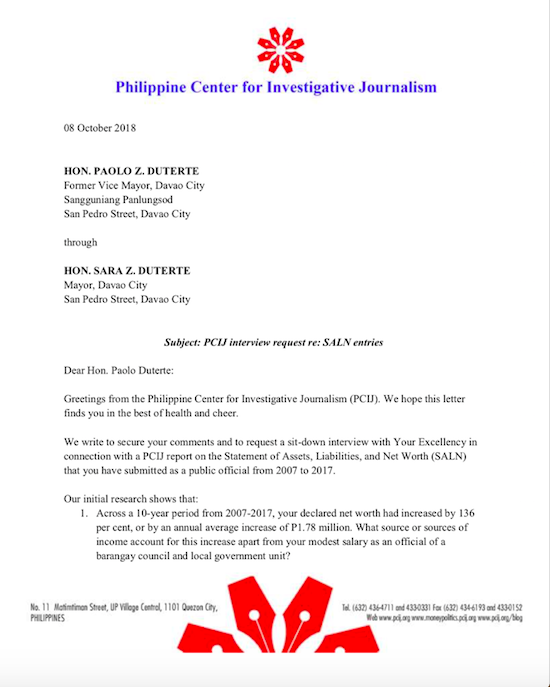 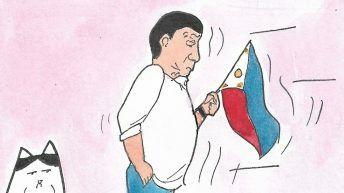 The President, for his part, could have confirmed or denied whether the Sammy Uy he identified as his creditor is the same Davao businessman Sammy Uy who donated PhP30 million to his presidential campaign in May 2016. 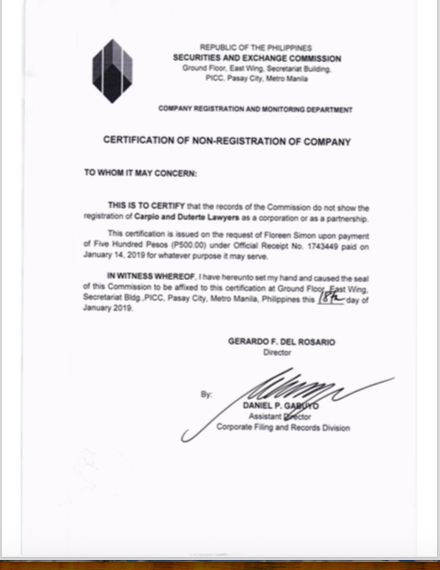 While it has not registered with the SEC, the “Carpio & Duterte Lawyers” entity was organized in 2008, according to Manases’s public profile on LinkedIn. 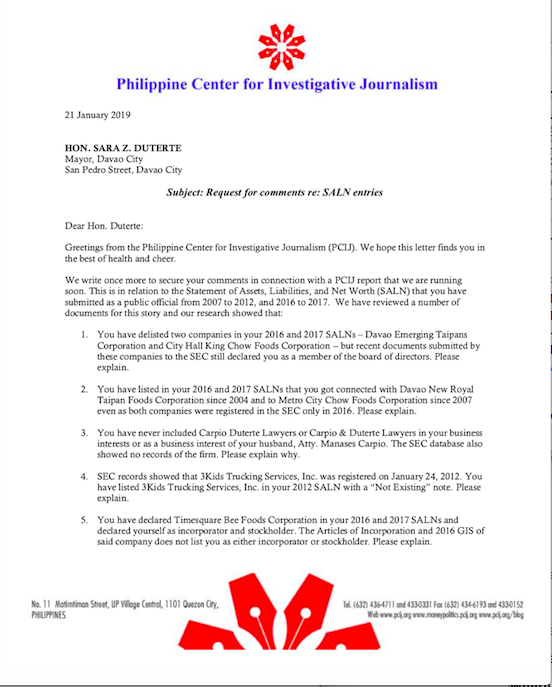 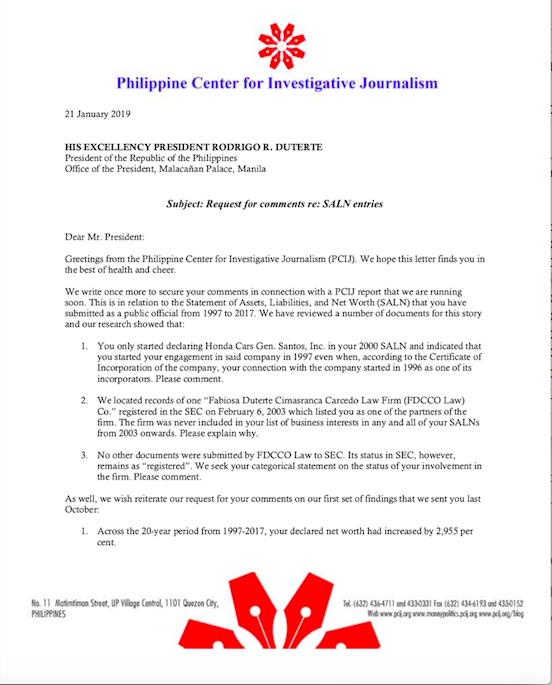 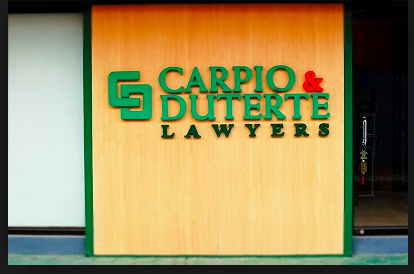 In her 2008 SALN, Sara had also put Manases as a “Law Office Partner” in the “Carpio-Duterte Law Office.” In her 2011 SALN, the reference to the firm was changed to “Carpio Duterte Lawyers.”The law firm, however, has yet to appear in Sara’s SALN declarations as among her business interests and financial connections. 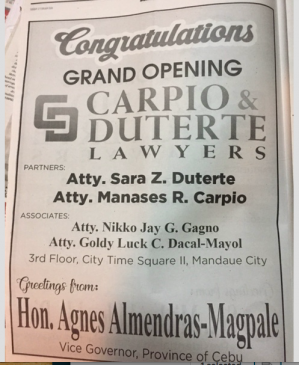 \But lawyering for big corporations with big cases before government regulatory agencies does not seem to bother President Duterte, even if it involves his daughter-mayor, son-in-law, and in-laws. 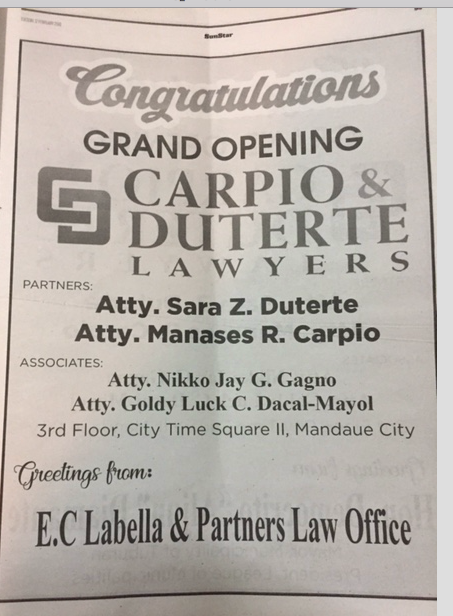 Carpio & Duterte Lawyers had a “grand opening” on Feb. 13, 2019 at the City Times Square II in Mandaue City. 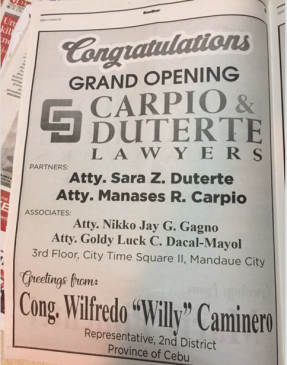 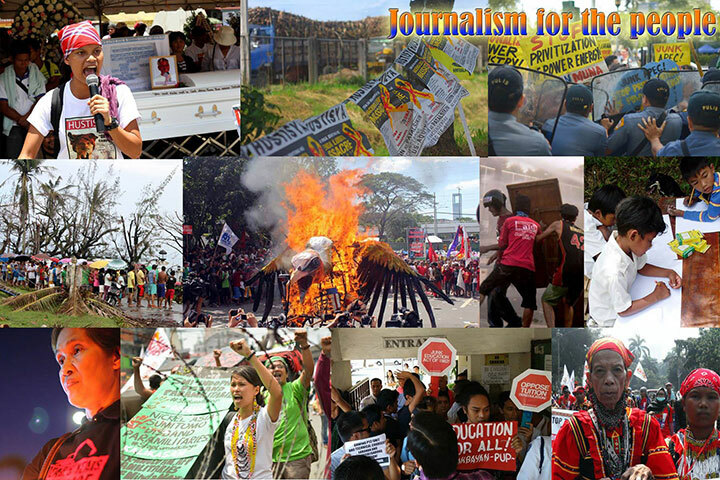 At least 13 congratulatory half-page ads ran simultaneously in SunStar Cebunewspaper from a variety of political and corporate well-wishers. 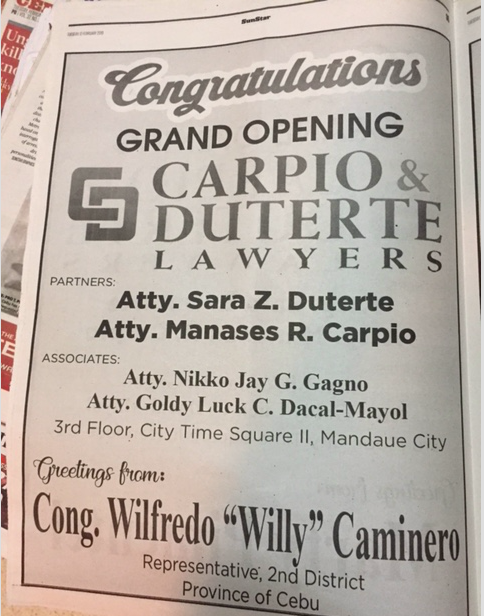 The identical greeting ads came from Presidential Assistant for the Visayas Michael Lloyd Dino; Cebu Vice Gov. 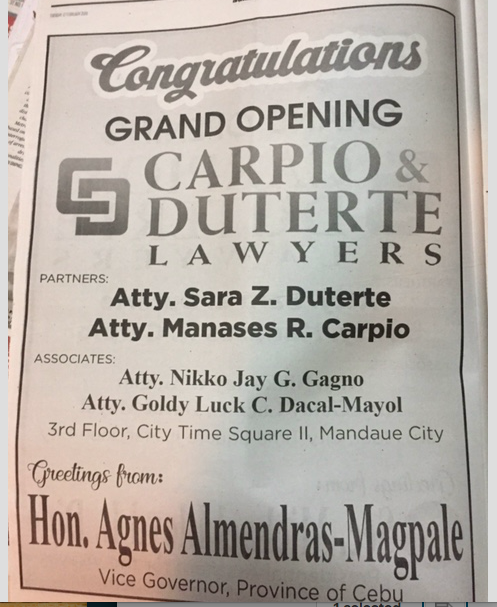 Agnes Almendras-Magpale; E.C. 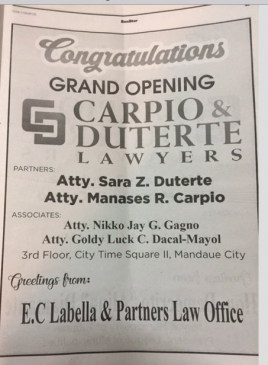 Labella & Partners Law Office that is owned by Cebu City Vice Mayor Edgardo Labella, Sara Duterte’s Hugpong ng Pagbabago candidate for mayor against incumbent Mayor Tomas Osmena; Tuburan Mayor Democrito ‘Aljun’ Diamante; Marty Pimentel; Rep. Wilfredo “Willy” Caminero (Cebu, 2ndDist. 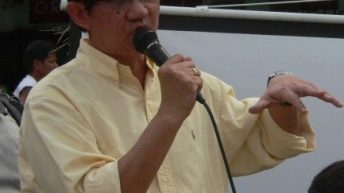 ); Rep. Peter John D. Calderon (Cebu, 7thDist. 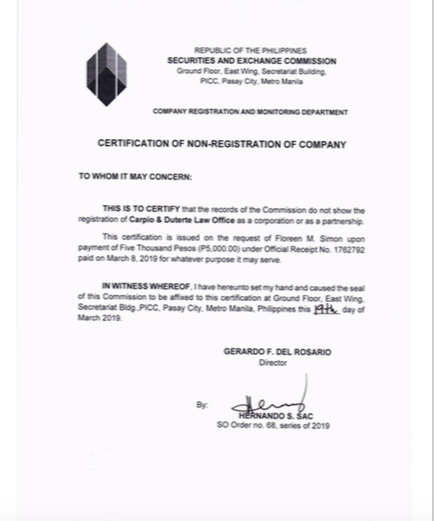 ); Toyota Team Cebu (Talisay, Lapu-Lapu, Mandaue North, Mandaue South); motorcycle dealer Du Ek Sam, Inc.; Catalina Car Rentals; Topline Express Ferries; Stradcom Corporation; Roble Shipping, Inc.; and Hercules Transport, Inc. In January 2017, President Duterte appointed the firm’s managing partner, Filemon S. Cimafranca Jr., then 70, as independent director of the United Coconut Planters’ Bank; he was later named director also of UCPB Securities, Inc. 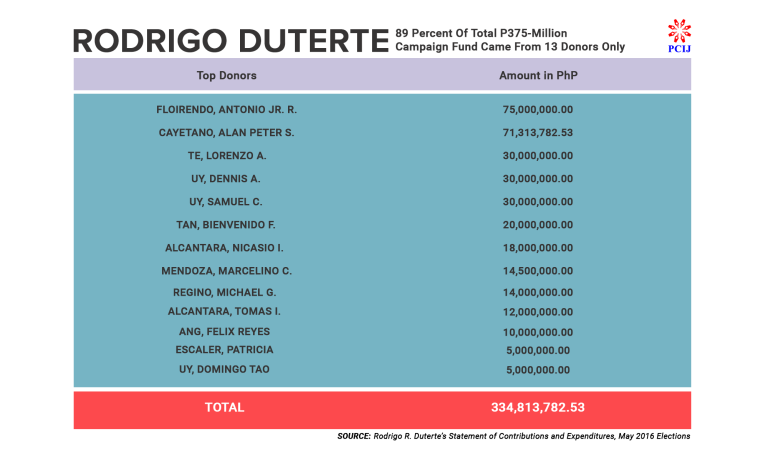 The government has a 73.9 percent stake in UCPB.